Ok you guys… wanna see something seriously amazing? 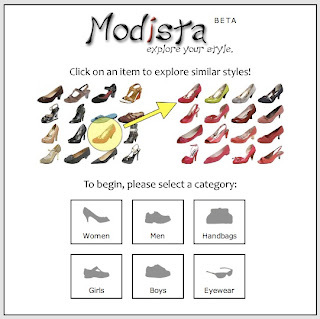 Check out Modista.com! Friends Arlo Faria and AJ Shankar started this website after winning first place in the 2008 UC Berkeley Business Plan Competition and I think it’s genius! Faria says they started this site to help their girlfriends find cheaper look-alikes of designer brands. Isn’t that what we ALL want!? You can browse shoes according to their visual similarity, meaning you can look by color, shape, style… the sky is the limit! I can’t exactly figure out how they do it. I think they have magic shoe fairies working in your computer or something- it’s seriously mind blowing how quickly and easily all the shoes are grouped and lined up. Anyway, check this out. I back it and think in time can get be even better- adding higher end designers, etc. I look forward to seeing this new site grow. Nicholas Kirkwood x Keith Haring ShoeGirl Discount! Greetings Earthlings… Fall? Are You There?? How about these shoes ?